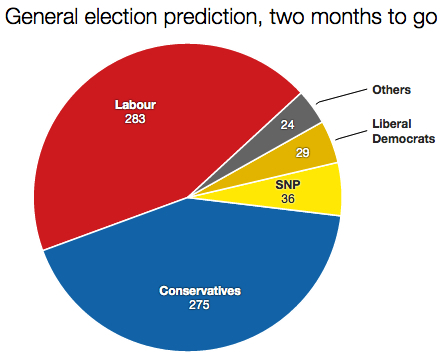 Were it not for the SNP, my monthly predictions of the election result would barely have changed since last autumn. Instead, the gap between Labour and the Tories keeps on shrinking as the nationalists continue their advance across Labour’s Scottish heartlands. Labour’s total of 283 is up 25 on its result in 2010. It includes Corby, which the party won in a by-election in 2012, but not Bradford West, which I’m now predicting George Galloway will hold for Respect. The Conservatives’ total of 275 is down 31 on what they got in 2010, and doesn’t include the seat of the Speaker John Bercow. He is counted within the figure for “others”, which also includes Caroline Lucas holding her seat for the Greens in Brighton Pavilion, Plaid Cymru keeping its three seats, the 18 constituencies in Northern Ireland, and three seats for Ukip. One of those will almost certainly be Douglas Carswell in Clacton. I now think Ukip will win two further seats, both from the Tories. My instinct at the moment is these will be Boston & Skegness and Thurrock, and that Nigel Farage will fail to win Thanet South. I’ve increased my prediction for the SNP. This month I’ve put them on a total of 36 seats, which represents an increase of 30 on 2010. I’ve handed them eight gains from the Liberal Democrats and 22 from Labour. As usual I’m erring on the side of caution and possibly underestimating the size of the party’s advance, but for the first time I’m suggesting that the SNP will win over half of Labour’s current seats. Unsurprisingly, no combination of two parties would add up to 326 seats: the theoretical number needed for an absolute majority in the House of Commons. The closest would be a Labour-SNP coalition, which would total 319 seats: seven short. A Labour-Lib Dem coalition would total 312, while a Tory-Lib Dem coalition would come to 304. Some sort of grand coalition, or multi-party agreement, would be another alternative. Based on my prediction, Labour + Lib Dem + SNP would equal 348, while Labour + SNP + Plaid Cymru + SDLP would equal 325. I can’t see how the Conservatives would be able to put together enough support to reach even 326. The closest they’d get would be Tories + Lib Dems + DUP, which equals 312. Here’s how I calculated this month’s totals, which are compared with the 2010 general election result. From the Lib Dems: Norwich South, Bradford East, Brent Central, Burnley, Manchester Withington, Birmingham Yardley, Hornsey & Wood Green, Cardiff Central, Redcar and Cambridge (total = 10). From the Tories: Warwickshire North, Hendon, Cardiff North, Sherwood, Stockton South, Lancaster & Fleetwood, Broxtowe, Amber Valley, Wolverhampton South West, Waveney, Carlisle, Morecambe & Lunesdale, Weaver Vale, Lincoln, Plymouth Sutton & Devonport, Stroud, Bedford, Dewsbury, Warrington South, Pudsey, Enfield North, Northampton North, Brentford & Isleworth, Halesowen & Rowley Regis, Nuneaton, Ipswich, Croydon Central, Erewash, Ealing Central & Acton, Norwich North, Dudley South, Bury North, City of Chester, Worcester, Keighley, Corby, Cannock Chase and Wirral West (total = 38). From the Lib Dems: Solihull, Dorset Mid & Poole North, Wells, St Austell & Newquay, Somerton & Frome, Chippenham, Berwick-upon-Tweed, Portsmouth South, St Ives and Taunton Deane. From the Lib Dems: Gordon, Argyll & Bute, Caithness Sutherland & Easter Ross, West Aberdeenshire & Kincardine, Dunbartonshire East, Inverness Nairn Badenoch & Strathspey, Edinburgh West and Fife North East (total = 8). From Labour: Ochil & South Perthshire, Inverclyde, Dundee West, Falkirk, Aberdeen North, North Ayrshire & Arran, Airdrie & Shotts, Glasgow East, Livingston, Edinburgh East, Midlothian, Linlithgow & East Falkirk, Glasgow South, Glasgow North, Glasgow Central, Glasgow North West, Dunbartonshire West, Kilmarnock & Loudoun, East Kilbride Strathhaven & Lesmahagow, Lanark & Hamilton East, Glasgow South West and Motherwell & Wishaw (total = 22). From the Conservatives: Clacton, Thurrock and Boston & Skegness. I am inclined to think Con will have most seats but only a lead over Labour of 20 maximum. I continue to ponder Bradford W and hope we get an Ashcroft poll there. I note you expect Con to retain its only Scottish seat. I never bet on horses but I do on elections and if you can bet on ridiculous outcomes like UKIP or LDs most seats, I really think you should be able to predict Con/Lab tie which is not impossible! Yes, I can’t see the SNP toppling David Mundell. I think that’s one scalp too far. I’m sticking to minority government and second election in 6 to 12 months. I really think that the SNP will get around 50 seats. The problem for Labour is there are too many rotten boroughs in Scotland – the local Labour branch in many areas is just not used to competitive parliamentary elections and hence doesn’t have the necessary infrastructure for an effective campaign. This is also why they’re haemorrhaging votes to UKIP across Northern England and making such a pig’s ear of winning back Bradford West, and arguably a contributory factor to the issues in Rotherham Borough Council – these are places where Labour has been unchallenged for decades. I think many of the tory marginals will not fall to labour, and possibly the two Southampton seats may go the other way. UKIP also i cant see winning anywhere other than Clacton. my estimate is the Tories ending in the 290’s with labour maybe as far back as 260s if Scotland falls. It may well be true that Labour’s organisation is moribund in many Scottish seats – but is the SNP really in a better position? They may have had an influx of new members but I doubt many are experienced campaigners – at best, they would have cut their teeth in the referendum – and I doubt they have the infrastructure in place either. I also believe the SNP hasn’t even selected candidates for many of the seats they are now projected to win and chosen novices in others.